An LDD file can be downloaded from here. The Star Scout line of scouts was launched in 2510 as part of Star Force's new fleet of aerospace fighters. Previously, Star Force's lineup was fairly limited, with the two multipurpose Star Falcon and Star Phoenix models, the Star Cruiser light bomber, the Spitfire gunship, and the aging Supreme Class Heavy Fighter. 2510 brought big changes to Star Force. They acquired the rights to refit and build the PCG's Sky Hawk Light Fighter (credit to Soccergirl535), and also started on refitting the Star Phoenix. 2510 also saw the production of three new purpose built aerospace craft, the Star Scout Class Scout, Star Thunderbolt Class Heavy Bomber, and later in the year, the Star Interceptor Class Interceptor. The focus of this creation, the Star Scout III, is the third version of the fighter. The Star Scout is pretty large dimensionally. She's tall in length and has long wings. The engines are tuned for fuel economy, and the 'Scout's spacious dimensions allow for a larger dilithium capacity than other fighters. Combined, the Star Scout can remain powered up and in flight for a long time, scouting about with its powerful sensors, able to detect the presence of enemies tens of lightyears away, and provide the exact locations and placement of closer targets, crucial for fleet movements and planning. The Star Scout III is armed with two MP1000 light phaser cannons an two MP1500 medium phaser cannons, and a modest supply of micro photon torpedoes. The 'Scout can also be equipped with photon bombs in the back, or additional sensory equipment, depending on location. The Star Scout lineup is also well known for how easy it is to pilot one of these planes. The Star Scout III is no exception, though it isn't much of a performer. The 'Scout moves steadily, both in speed and handling, but its limits aren't close to extreme. Its roll rate is also a little slow in atmospheric conditions. As it is a light craft, the 'Scout III is plated with less ablative armor than its combat-purposed cousins. It's still armored of course, but less so. Nevertheless, the Star Scout is considered a capable lineup, praised for how easy it is to jump in and fly for inexperienced pilots. 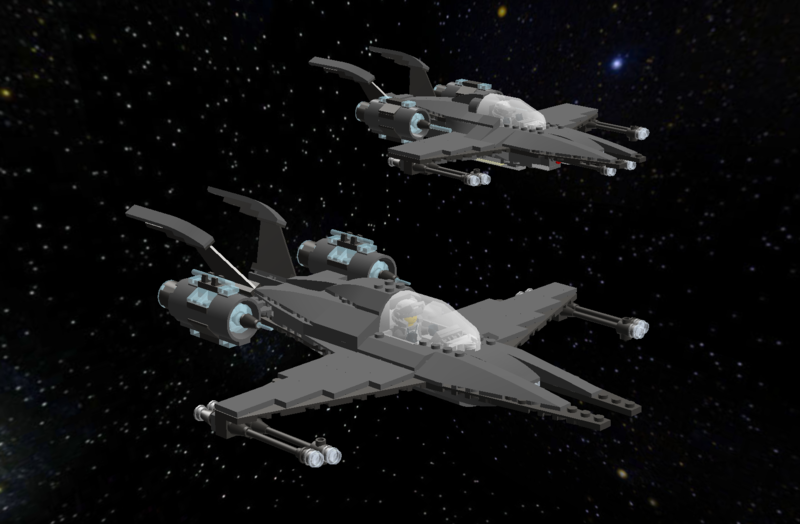 It is common for Star Scouts to be mistaken for the similarly-styled Star Phoenix fighters. Star Scout III and Star Phoenix VI. Nice fighter design. I really like it. Like your other fighter models, it's very smooth and graceful, and the SNOT underside is really neat. Overall, it looks wonderful! Thanks. I can tell ya, putting SNOT underbodies on these little fighters is a real pain in the underbody, cause then I have to make sure everything's completely connected, even if the means are quite impractical.